Barcelona's Suzy And Los Quattro are back with album number four and after a slight departure with the previous pensive album, Hank, it's back to what they are best at. Faster And Louder is in Holly And The Italians territory and there is no greater compliment. 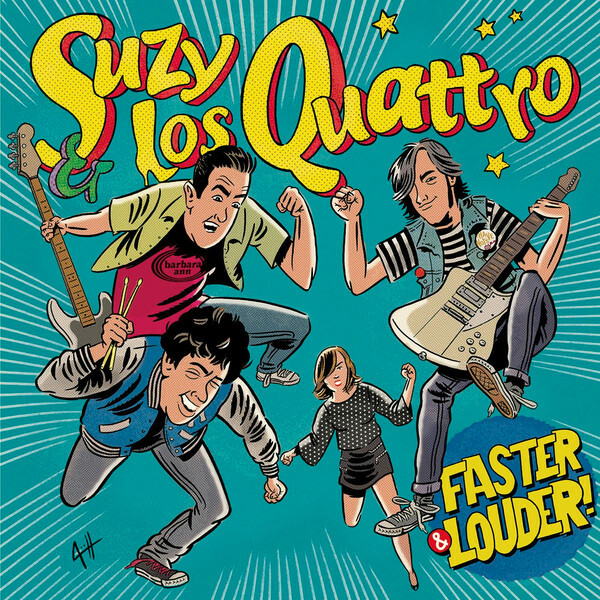 Suzy And Los Quattro are like a rocked up Rubinoos and that's no surprise as they've supported the power pop greats, plus Tommy Dunbar co-writes Matilda here. The riff quota is high here and when you note Robbie Rist adding Guitar on five of the ten songs, that's to be expected. Here We Go Again comes across as early Blondie, PMS is almost thrash metal. Walk Away is also sped up. Everybody is more New Wave than Power Pop whilst Be With You rocks like a good 'un. The band are at their best though when the concentration is on the melody, the riffs shine through and whilst these songs won't translate as well as Be With You in a live setting, they showcase what the band is best at. Matilda is pure Rubinoos, Tommy Dunbar and Robbie Rist's involvement ensures that. You suspect with all the band members having Quattro surnames that they want to be The Ramones. There's nothing wrong with that at all, don't we all, but there is far more to them than that. This is classic New Wave Power Pop comparable to the likes of The Knack and The Records and that is where they shine. I don't hear many sounding as good with original songs. This is a cracking album. Just over 25 minutes of hooks and choruses. What's not to like? You can listen to and buy the album here. You should, at 7 Euros it's an absolute snip. Thank you very much for a raving review!